Artec Industries' NEW JK HD CROSSMEMBER is designed to give your 2007 - 2017 Jeep JK Wrangler better protection underneath the vehicle than the factory sheet metal. Designed using CAD files directly from the manufacturer, this HD Crossmember ensures that you have a great fit with factory components. Made from 1/4" thick Steel, and CNC cut and formed, the Artec JK HD CROSSMEMBER will be sure to hold up to the abuse you put on your rig. JK HD Crossmember Artec Industries' NEW JK HD CROSSMEMBER is designed to give your 2007 - 2017 Jeep JK Wrangler better protection underneath the vehicle than the factory sheet metal. 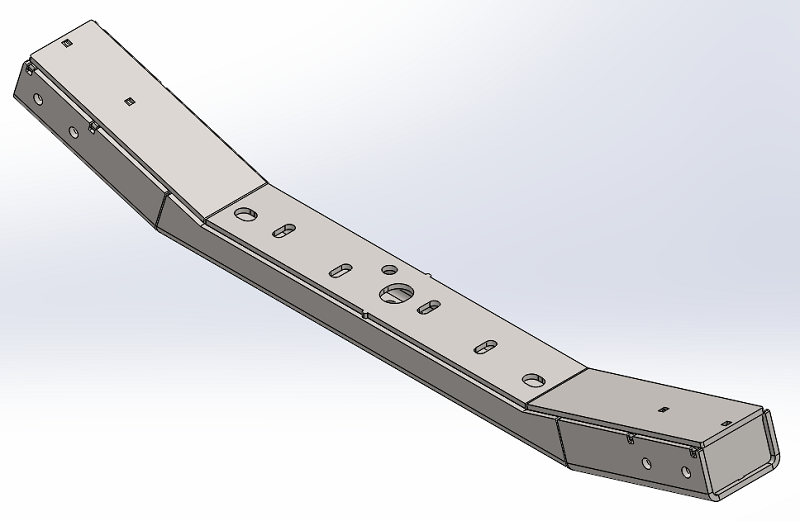 Designed using CAD files directly from the manufacturer, this HD Crossmember ensures that you have a great fit with factory components. 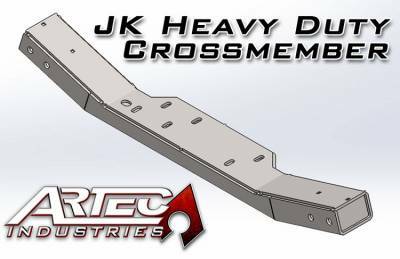 Made from 1/4" thick Steel, and CNC cut and formed, the Artec JK HD CROSSMEMBER will be sure to hold up to the abuse you put on your rig. Designed from factory CAD files for great and precise fit. Bolts right in. Not painted so it's easy to customize and touch-up when it scratches. Choose between standard replacement or long arm version with lower link mounts. Perfect companion to our JK UNDER ARMOR Belly pans for completely smooth under side. This crossmember uses 3/8" course threads captive nuts and bolts for the skid plates so you can get new flat head or button head style bolts. Hardware not included. NOTE: This crossmember changes the factory captured nuts from M12 to 3/8" to work with our JK Under Armor Bellypan kit. New skid plate hardware is NOT shipped with this crossmember but with the bellypan. New 3/8" bolts will be needed along with extra wide washers that may be necessary for use with factory skid plates. NOTE: This product requires general mechanics skills and should only be installed by someone capable of using basic tools. Artec Industries is not responsible for incorrect installation. By purchasing, the customer agrees that they are fully responsible for correct installation.